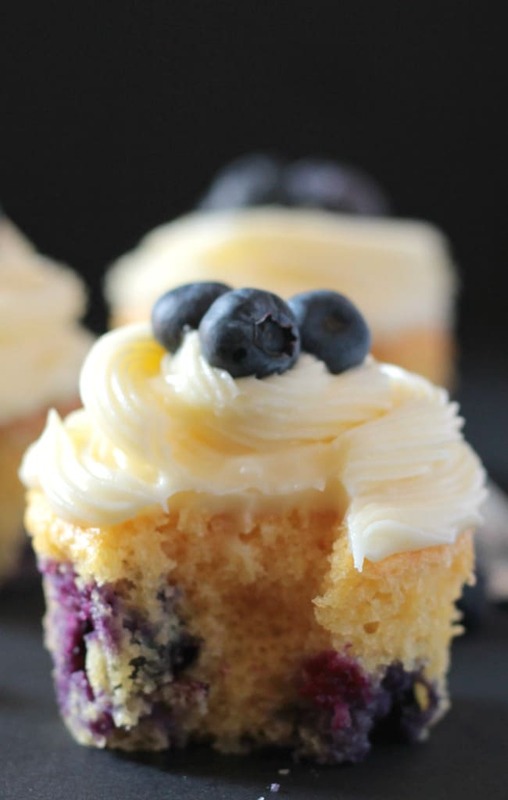 Once upon a time, I made a batch of Blueberry Cupcakes with Lemon Cream Cheese Frosting, and then ate them all. Okay, maybe not all. My husband and toddler were also involved in the mass cupcake consumption in our home. Every last crumb was gone. Because these cupcakes were deliciously soft, moist and comprised of little bursts of blueberry sweetness. May they reside in cupcake heaven happily ever after. Okay that sounds weird, maybe it’s the sugar overload talking in me? But there’s also one more reason that I’m so excited and so in love with today’s recipe: It’s my first post as part of Yum of the Month which is a new monthly challenge I’m participating in. The Yum of the Month is a monthly recipe challenge that I’ve teamed up to do with four fabulous food bloggers. 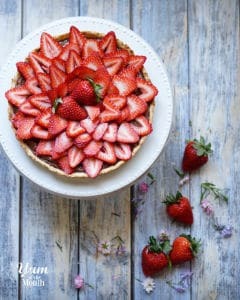 The way this recipe challenge works is that each month a member decides on a theme for the month, and all of the members have to make a recipe around that theme. This month’s theme (the very first one!) was fresh fruit. And that’s how these Blueberry Cupcakes with Lemon Cream Cheese Frosting were born. I actually thought of making blueberry muffins, but then I decided I wanted to make a recipe that was pretty and delicate, so came in the cupcakes. Shadi blogs at Unicorns in the Kitchen and her cooking expertise ranges from mouthwatering Persian recipes and contemporary desserts such as delectable molten lava cakes. 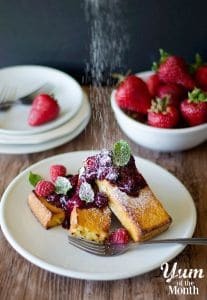 Amy blogs at Accidental Happy Baker, and has fabulous recipes and gorgeous photos. Michelle is brilliant at coming up with mouthwatering desserts such as Nutella Stuffed Shakoy (Twisted Donuts). Omg, yum! She blogs at Giraffes Can Bake. Samantha blogs at Sugar Spun Run and makes the most beautiful not to mention delicious treats! So before you go on to read the recipe, I want to confess something. I’m a cheater. There, I said it. No, not that kind of cheater. 😉 But I sort of used a short cut in this recipe. I used cake mix. Now, normally I’m all about baking from scratch like these Ooey Gooey Nutella Cookies and Golden Oreo Salted Caramel Mini Cheesecakes. But, sometimes, I like to cheat a bit and use cake mix. However, it’s not just cake mix that I used, I added a few ingredients to make it even more delicious! 1.) Only use the ingredients I’ve listed in the recipe card. Please do not add the ingredients that are on the back of the box mix. 2.) The yogurt and buttermilk help to make the cupcakes very moist and also give them a slight tang. It’s very easy to make buttermilk at home: 1 cup milk + 1 to 2 tablespoons of white vinegar. Stir and wait for 1-2 minutes. When the milk appears curdled, your buttermilk is ready to be used. 3.) For the cream cheese frosting, I used Philadelphia cream cheese which comes in blocks. Don’t use a cream cheese spread because it will thin out the frosting. 4.) The butter for the cream cheese frosting should be at room temperature. If it’s too cold or almost melted the frosting will not whip properly. I like to take out the butter from the fridge about thirty minutes before I start baking so that it’s at room temperature when I need to use it. So I hope you enjoy these Blueberry Cupcakes with Lemon Cream Cheese Frosting, and hope that they reminds you of spring, butterflies and blooming flowers. Don’t forget to check out the rest of my fellow Yum of the Month members’ recipes right below the recipe. 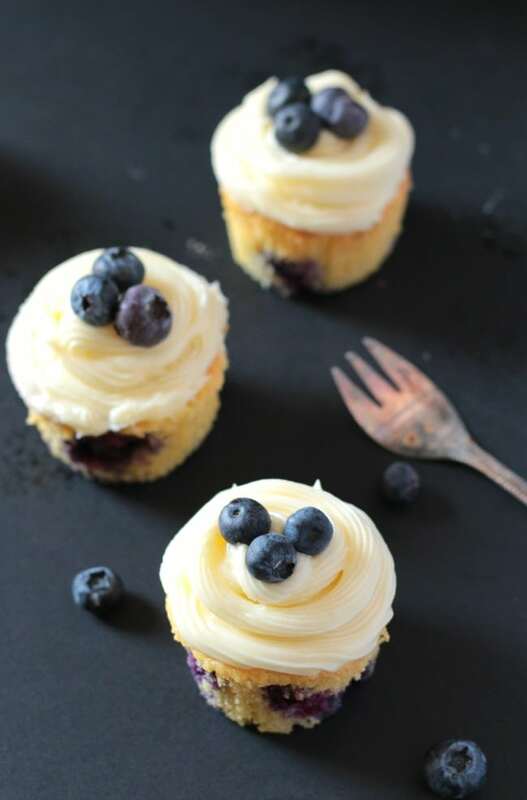 These blueberry cupcakes with lemon cream cheese frosting are so quick and easy to make, not to mention delicious! These look soooooooo yummy, I can see why they disappeared so quickly – they wouldn’t stand a chance in my house either! 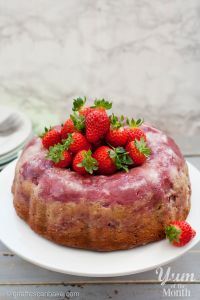 And you can totally be forgiven for using a cake mix before with all those other yummifying (totally a word) ingredients they sound perfect – epsecially with all those juicy blueberries throughout. I had a very bad experience the last time I baked with blueberries (I don’t know what was wrong with them but the blueberries were DISGUSTING, I literally spat out the bite of muffin they were that bad) so I think I need to try these to cleanse my blueberry palate! You mention buttermilk under the ingredients but never use it- but I this hitter gets used twice in the recipe…. I didn’t realize this until I am halfway through. Uh oh. Help? Hi Kelly! I’m so sorry it was a typo, you were supposed to add the buttermilk with all the other wet ingredients. I’ve updated the recipe now. Many apologies for this! I love that you put yogurt in these cupcakes! Baking with yogurt makes things so moist. These cupcakes look absolutely divine! Should the last ingredient say “3 cups powdered sugar”? I made this yesterday and my whole family lovessss them! My icing didn’t set like it should have, it was runny, it didn’t run completely down the sides but it was no where near firm enough to pipe. Any ideas as to what I could of done wrong? I’m also thinking about adding some lemon zest to the batter next time to give it a little extra lemon flavor! 1.) The butter was maybe too softened? Was it on the runny side? It should be just room temperature. 2.) What kind of cheese cream did you use? I use Philadelphia cream cheese, the kind that comes in block. Not the kind that is spreadable and used for breakfast. If you used cream cheese spread that might have caused the icing to be runny. 3.) Did you try adding more icing sugar to the frosting? That usually helps in setting up the frosting to become thicker. Could you substitute Greek yogurt instead of regular yogurt? If using frozen blueberries, should I use them frozen or thaw and drain before adding? You can use them frozen. Hope this helps! Hi, I was just wondering if this recipe would work as a cake rather than cupcakes? Yes, it absolutely would! I would bake it in a 9 by 13 baking dish though! Ever attempted these as mini cupcakes instead of full size? Hi Allison, no I haven’t made these as mini cupcakes but I think it should be fine, just keep in mind that the baking time may be reduced. Hope this helps! Can anything be used instead of yogurt? My husband is allergic to it. Plain yogurt? I’m thinking maybe lemon or blueberry or maybe half and half ? When you say full fat yogurt, are you meaning plain or vanilla? Could sour cream be used in place of yogurt? Yes, I think that should be fine, although I haven’t tried the recipe with sour cream. I need to make a gluten free dessert for a gathering and bought a gluten free yellow cake mix. Any thoughts on whether I would need to make any other adjustments to your recipe if I used the gf cake mix? Hi Cecille! Unfortunately I haven’t made these cupcakes as gluten free, so I’m not sure I would have any correct advice for you. Did you end up making these with a gluten free mix? 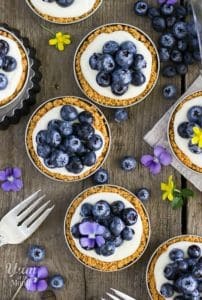 Can I use a full fat blueberry yougert for extra blueberry flavor instead of plain? 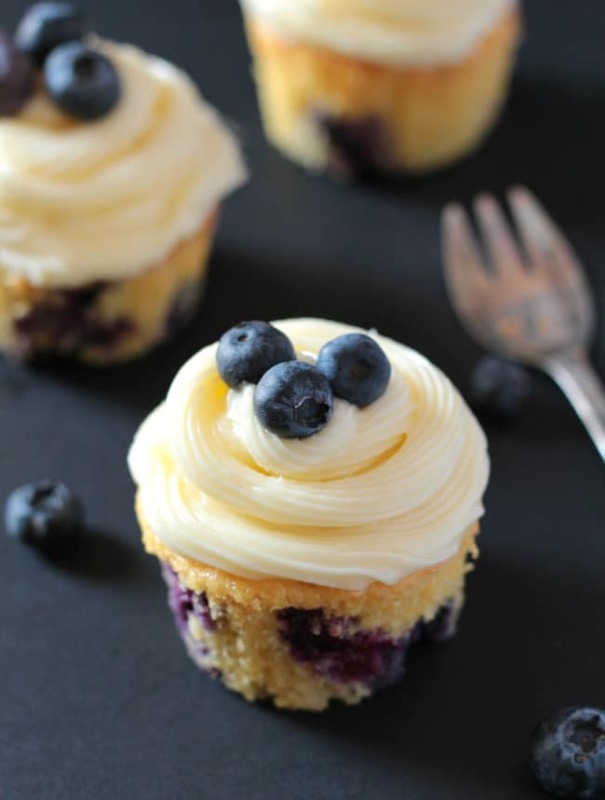 Want to make the blueberry and lemon cupcakes for a bridal shower. Can these cupcakes be made ahead and frozen? These look fantastic 🙂 . I’m going to try and make them today. Does oil matter on what is used ? I usually use coconut. What type did u use? Should I use unsalted or salted butter? I made these for my staff at work, and they all raved about them! The people who prefer cake loved the icing too and the icing lovers loved the cake too. I have no doubt I will get requests for these again. Hi, I made a blueberry bundt cake and the recipe called to shake 2 tblsp. Of four with the berries so they won’t sink to the bottom and it worked beautifully. Did you shake the berries in flour or did they not sink to the bottom of the cupcakes? I absolutely love this recipe! I’ve used it before and it was incredible! I’m changing it up a bit today for my mother’s birthday cake..
Store it in a glass jar with a lid. No feeling guilty . can I use a stand mixer? that is what I have to mix things now. please let me know. I just got these out of the oven and I’m not serving them until tomorrow. Do I need to refrigerate them until just before I serve them? Just wondering about the cream cheese, butter, blueberries, etc. in them and sitting out on the counter in Tupperware. Oh, and one of them looked a bit lopsided and needed to be tasted. 😉 Sooooooo yum!!!!! OH MY YUM!! This recipe is delicious! I made it in the cake form and it turned out awesome!! Will be making this again! It depends on the weather. If it’s not too hot then yes they can be kept at room temperature, but if keeping overnight then I would suggest putting them in the fridge! Both cupcakes and frosting taste amazing! 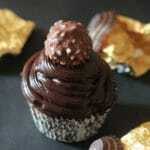 I’m a chocoholic and I would make these over chocolate cupcakes any time! I’m going to search around your site to pick up more gems. Thank you so much! Doesn’t look like any answer was given when asked about freezing…….I could use that info also. Hi, I live in the UK. What is the weight of the flour in the cake box? It seems we don’t have the same measurements here.